With a perforated vinyl, 100% cotton lined upper and ½ inch moldable foam sole; this is our number one selling diabetic post-op shoe. These features in conjunction with our rigid slip resistant sole Read more..
A canvas upper and ¼ inch durable foam insole are hallmarks of our most popular post-op shoe. 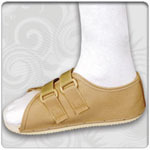 A rigid slip resistant sole and Velcro® loop lock closure compliment this number one seller. This sized p Read more..
A perforated vinyl felt lined upper provides breathability and the terry cloth lined foam insole provides a comfortable interface with the slip resistant, rigid hard sole. This sized post-op shoe fit Read more.. 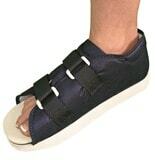 This is our economy post-op shoe. Vinyl and canvas lined foam upper construction in conjunction with a soft foam insole; our rigid slip resistant sole and secure lace-up closure make this a smart buy Read more.. This breathable mesh low top post-op shoe comes with a slip resistant, semi-rigid rocker sole for a natural gait. The adjustable tongue and cushioned arch support provide just the right comfort. 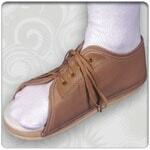 Conv Read more..
Post op shoes are an effective help for post surgery recovery period.